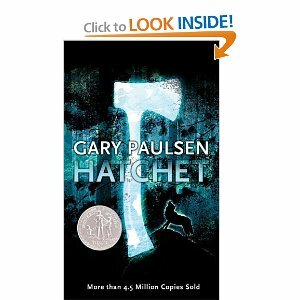 The book Hatchet" is about a teenager boy who gets stranded on the Canadian wilderness. Brain is flying on a plane to visit his dad and the pilot gets a heart attack. But, Brian doesn't have any experience to drive a plane, so he crashes and lands in the water and he has to swim all the way to land. He ends up at the Canadian Wilderness. he builds a shelter from his hatchet, his mother gave him, and the wilderness is a forest so he cuts down a lot of trees. Brian is struggling to get a fire, but finally he succeeds by using his hatchet and a rock. What Brian eats is raspberries at first, then he tries to eat fish, but he finally just eats bird, with his bow and arrow he invented. He drinks the water in the lake he first landed on. In the beginning he saw a bear, in the middle he saw another bear with cubs, and also in the middle he saw a wolf, and again in the middle he saw a porcupine and it shot quills at Brian's leg, It hurt him bad. Also toward the end Brain saw a moose close to the lake and it pushed Brian into the water again and again and finally he got up and his ribs were hurt because that was where the moose had hit him. A very major sad event comes towards the end, something bad happened to his shelter that makes Brain work again and rebuild his shelter and wait until he was saved. If I was Brian Robeson and I was stranded on an island I would first look for food,then I would walk around the island and look for some wood or some strong material to use fro a shelter. Also if I was struck by a moose I would have carried my hatchet and killed the moose and carried it back to my shelter, get some firewood to cook the moose and eat it. Just to be prepared, carry a cell phone to contact if needed. This book is such a good book! Brian was able to figure out things on his own and learn from bad events, which is a very good lesson. The way the author describes everything with such detail is what makes this book so easy to understand. In the book it is so exciting, Brian meets so many animals, like wolves, bears and moose. And how resourceful Brian is amazing. he makes a bow and arrow just with his hatchet. he makes a pen that keeps fish alive in the water! That is what I would call amazing. You probably have to be really talented to do that. For people that like survival stories things with adventures you will love this book. I guarantee it. Thank you I will gladly pass that on to the student.